Who are the best fantasy football plays for building an optimal DFS lineup in Week 14 of the 2018 NFL season? As we do every Saturday, this piece brings you the DFS locks of the week. The game isn’t in New Orleans, but Brees and the Saints are still eight-point favorites against the Buccaneers in a game with the highest over/under of Week 14 (55.5). The Bucs have given up the third-most fantasy points to quarterbacks, most touchdowns (28), and third-most yards (3,507). The other quarterback in the should-be-high-scoring Buccaneers/Saints game, Winston appears to have starting duties fully locked up with no real risk of being benched anymore. In his four full games, Winston ranks first among quarterbacks in total points. (He’s second in points per game behind Patrick Mahomes). Roethlisberger takes on a Raiders defense giving up by far the most fantasy points per dropback to opposing quarterbacks (0.68). For comparison, no other team is giving up more than 0.59 PPDB. 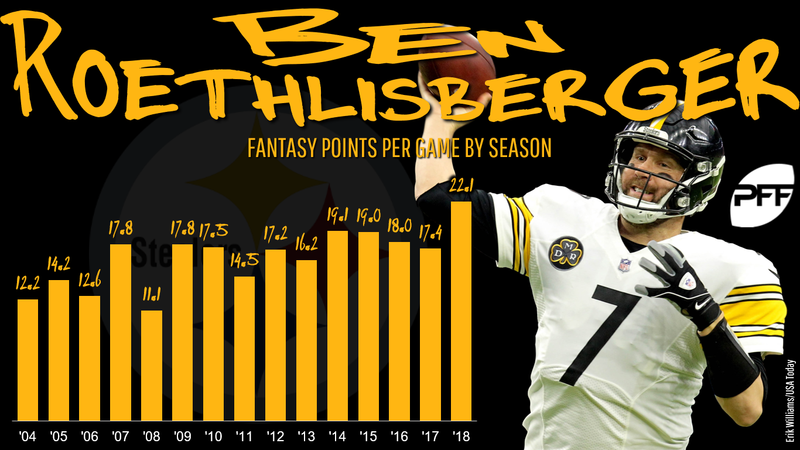 Quarterbacks are averaging over 8.5 YPA against Oakland, and Roethlisberger’s home/road splits really haven’t come into play this year (he’s averaging 24.5 DK points per game on the road vs. 25.9 at home). Priced up but still worth it, McCaffrey draws the Browns, who have given up the eighth-most fantasy points to opposing running backs this year, fourth-most rushing touchdowns (12), and eighth-most receiving yards (628). Over the last six weeks, McCaffrey has 195.1 DraftKings points — 50.2 more than any other non-quarterback. Think about that for a second. Even if you remove his 52.7-point explosion in Week 12, McCaffrey is still the No. 2 overall player — not just running back — on DraftKings over the last month and a half. Kamara is the lowest price he’s been since Week 9, and third-lowest he’s been all season, despite a great matchup against the Buccaneers, who have given up the most fantasy points per touch (1.12) to running backs this season. Jones and the Packers are 5.5-point home favorites against the Falcons in a game with a high projected total (50.5). Jones’ newfound receiving chops will serve him well in fantasy against the Falcons, as Atlanta continues to cough up the most production to running backs through the air; their 94 receptions allowed to the position is most in the NFL. Too cheap to ignore, Samuels will be Pittsburgh’s starter and primary pass-catching back against the Raiders, who have allowed the most rushing yards (1,566) to running backs in the NFL. Wilson carried the ball 15 times last week and, importantly, caught eight of nine targets for 73 yards. Any player who can top 20 DraftKings points without topping 100 yards and without scoring — especially with such a cheap price tag — needs to be strongly considered. In four career games against the Buccaneers, Thomas averages nine receptions and 109 yards per game. The Buccaneers are the only team that has allowed a receiver to catch a touchdown against them in every game this season, so you have to like Thomas’ chances of finding the end zone, too. More often than not, Jones delivers against the Packers, with lines of 11-259-1 (17), 9-180-2 (12), and 5-108-0 (9) against Green Bay over the last few seasons. Jones should see a lot of Green Bay’s Tony Brown, who have covered just 45 routes this season while being targeted on a league-high 29% of his routes in coverage. Allen’s volume and production never really left this season, but he has returned to top fantasy form thanks to the fact he has scored a touchdown in four straight games. He’s coming off season-highs in targets (19), receptions (14), and yards (148), but despite the recent bump in red-zone usage, Allen’s price hasn’t increase much. He’s still cheaper than he was over the first half of the season. Sutton was a “must-play” earlier this season when Demaryius Thomas was traded out of Denver, and even though Sutton’s production hasn’t skyrocketed since then, the same logic applies leading into Week 14 as Sutton takes over No. 1 duties with Emmanuel Sanders sidelined for the rest of the season. He set a season-high in targets last week (7) even with Sanders healthy, and I’d consider that his baseline figure for Week 14. Godwin has the fourth-best individual WR/CB matchup of the week, as we expect shadow coverage from New Orleans’ Eli Apple, who is targeted on 23% of his routes covered — fourth-most in the NFL. Apple’s 1.96 yards per route covered is a bottom-12 figure among this week’s starting corners, too. Remember way back in Week 1, when we were concerned about Kelce with Mahomes because he only saw a few targets? Flash forward to now, and Kelce has double-digit targets (and receptions) in two straight games. In his four games with Nick Mullens, Kittle is averaging over six receptions on nine targets per game with at least 70 receiving yards in three contests. His volume, production, and big-play ability haven’t evaporated. 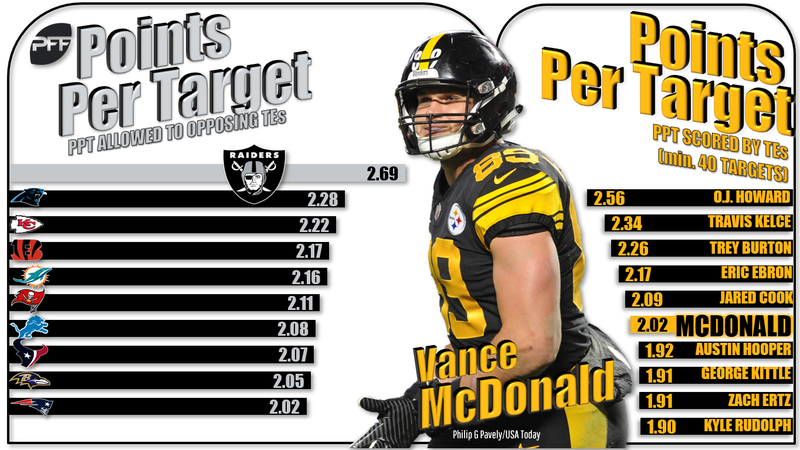 McDonald gets a great Week 14 matchup against the Raiders, who have allowed the most fantasy points per target to opposing tight ends this season (2.69). Basically, every tight end playing against Oakland turns into the best tight end in the world on a per-target basis. For comparison, Travis Kelce (2.34) and Zach Ertz (1.90) aren’t even close.